ROSEBURG, Ore. -- On Nov. 23, a federal judge is expected to rule on whether the Northwest Salmon Plan can be implemented, and for the Northwest River Partners, it has been a long time coming. Terry Flores, the executive director of the Northwest River Partners Coalition, told members of the Douglas Timber Operators this week that they have been to federal court several times and even had a ruling in their favor, only to have the judge decide there wasn't enough funding for the plan to work. So, now they are going back again and this time they hope the plan will be approved. 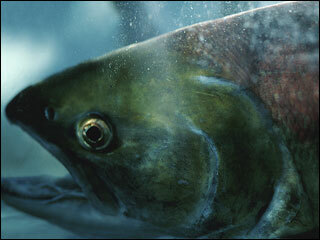 "We've been working with the sovereigns in developing this latest salmon plan," Flores said. "We went and met with the new administration; we supported it even though its quite costly for families and businesses who are going to pay for all the measures in the plan. So, we're hoping that the judge will rule favorably on it and allow all of us out of the courtroom and on to the business of helping the fish." The coalition is hoping the judge will rule in favor of the plan and let them concentrate on implementing it, instead of spending money on litigation. Meanwhile, Flores said a lot of work already has been done and they have not been sitting around waiting for a ruling. "Investments in the federal hydro-system to help fish travel more safely through the system were ongoing, this latest plan will add to that ongoing effort," Flores said. "Already, 15 to 30 percent of families and businesses' electric bills are going to help pay for these fish mitigation efforts that have been ongoing. This would just kind of seal the deal and allow us to get out of the courtroom and quit spending money on litigation and attorneys." Flores said the plan cost about $12 billion over the past 25 years. Judge James Redden will hear the case in federal court on Nov. 23, and Flores said his (her) group feels strongly that they've put together a consensus with good science to back it up.